The RESET Magazine has released another stunning issue! The cover feature is an Interview with Chester Kollschen of Knights of Bytes on the making of Sam’s Journey. 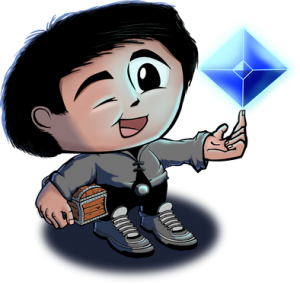 As the release is slowly approaching, we are now accepting preregistrations for Sam’s Journey on our in development site! Chester Kollschen, the coder of Sam’s Journey, was interviewed in February by Commodore Plus. 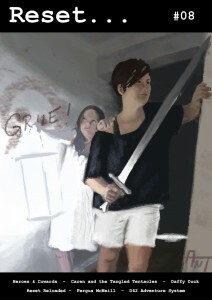 Sam is, by the way, still happily jumping, striking and throwing around items. We had issues with the first cardboard boxes printed (the printing house had zoomed our input files), but they are resolved now. We will soon disclose pictures of the box and some of the feelies. 8 Bit Civilizations has raised a few eyebrows all around the world – even in mainstream media. 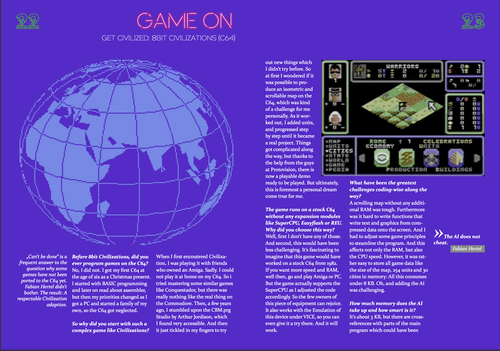 Fabian Hertel, the maker of 8-Bit Civilizations, was interviewed in the January issue of the Kilobyte Magazine. It’s still uncomfortable, windy and cold outside – the ideal wheather to take a short walk to a kiosk around the corner, get a hot coffee to go along with the current issue #33 of Retro magazine, and, back at home, sip the hot brew and enjoy a well-written review of Leisure Suit Leo 2. When you’re done sipping and reading Retro magazine from front to back, it’s time to turn on your 64 and load Scene World #24. 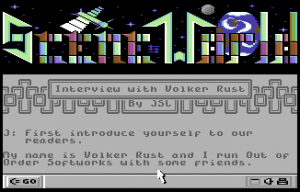 The current issue of the popular English disk magazine offers some comprehensive articles including an interview with none other than Volker Rust, who writes about his beginnings on the C64 and the upcoming blockbusters from Out of Order Softworks (spoilers ahead! 🙂 ). For more reading matter, visit our press section. 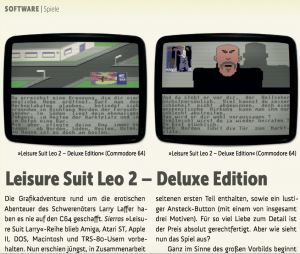 Issue 5 of Reset Magazine features a review of Leisure Suit Leo 2 Deluxe Edition. While the English version is technically the same as the original one from 1997, it comes with a manual in book form packed in a stylish box which makes it an ideal holiday gift for collectors of gaming treasures on the C64. Buyers of the German version also get a remastered edition of the game, plus an extra disk with the rare first installment. 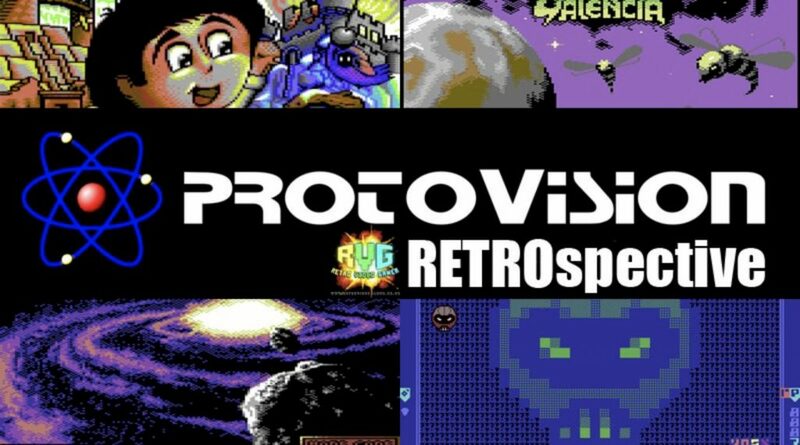 Reset is a free „C64 only“ PDF magazine with a focus on gaming. 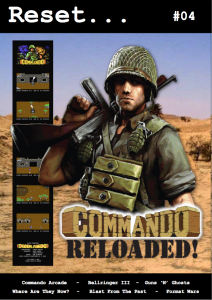 Commando Arcade from the Group Nostalgia – a surprise hit that should be part of any C64 game collection! Guns & Ghosts from the creative duo of Georg „Endurion“ Rottensteiner and Trevor „Smila“ Storey, which you can obtain at Psytronik or RGCD and which we have already warmly recommended in a previous Protovision newsletter. Bellringer III from Geir Straume, which has an 80’s charm and a gameplay in the tradition of hunchback. As well, our 4 Player compilation (that has been sold out in the meantime) was tested extensively on the latest Amiga User Group (#CommodoreClub) meeting in Melbourne. Sold out? Yes. But do not worry. You can still get the games individually as downloads (Bomb Mania, Hockey Mania, Team Patrol) or even as limited edition (Tanks 3000) from our shop.